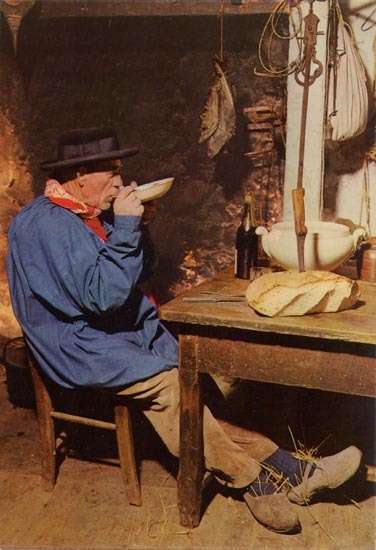 Faire chabrot… it’s a rustic tradition from rural France that continues to this day in the Southwest, my region. It’s an expression of conviviality and continuity, of simple pleasures at the table. So what is chabrot? It’s a fun way to finish a bowl of soup. 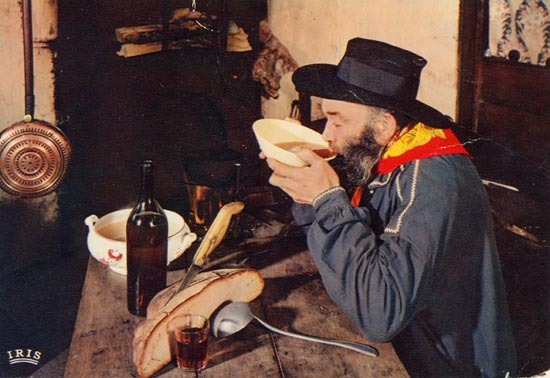 When in Gascony, it is often garbure, an improvised soup that varies by season and from one house to the next, though usually includes cabbage and confit of duck or goose. Some people keep a permanent pot of soup bubbling, and add vegetables and meat to it each day. A good broth is a staple in the day of many rural people. For chabrot (pronounced shab-row), just enjoy your soup and then leave a bit of the warm broth in the bowl. Naturally, you have red wine on the table, so pour in a dose of wine, I would say about half the amount of the broth, but you can do equal parts if you like. Soup, a hunk of bread and wine. All a man needs. There is no stirring and no spoon! Hold your bowl in two hands, swirl gently, and with elbows planted on the table, drink the wine and broth mixture. This is chabrot. 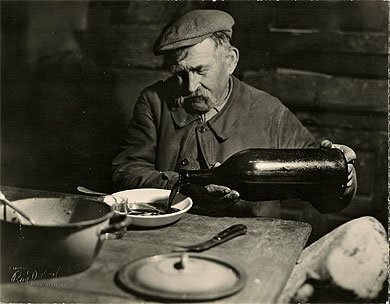 Considered very old school and a peculiar habit of rural people, and in some company bad manners (! ), it’s a tradition that l love to share with others. 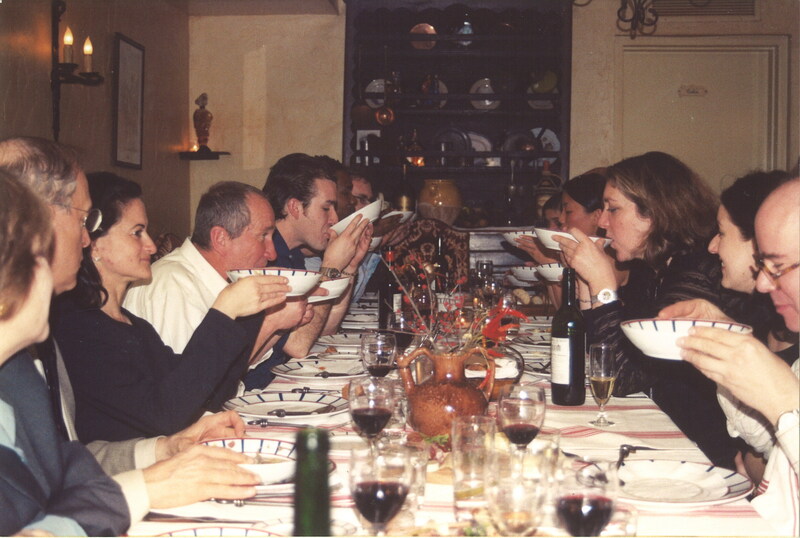 There is something about the warm broth and the wine together… and the whole table lifting bowls to their faces. It always stirs something in me. Perhaps it is the thought of a long line of ancestors who tipped their bowls through the generations. Or maybe it’s just the unique flavor of the raw wine and the broth together. Here, we chabrot at D’Artagnan: The Rotisserie, our now-closed restaurant in NYC. On the left is Georgette Farkas, the owner of the new Rotisserie Georgette. You can see how it’s done in this video I made with Ed Brown. We were in the kitchen making poule au pot and I couldn’t resist the chance to show him. So now that you know, go ahead and faire chabrot!